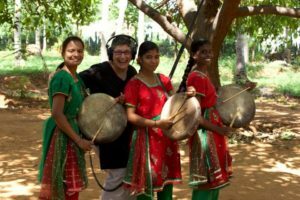 Dr. Zoe Sherinian, Professor of Ethnomusicology and Chair of the Division of Musicology, Ethnomusicology, and Music in General Studies at the University of Oklahoma, presented her work with the Sakthi Folk Cultural Center. The Sakthi Folk Cultural Centre uses the Tamil folk arts to develop self-esteem and economic skills in young poor Dalit women (outcastes or untouchables). The documentary film, Sakthi Vibrations, reveals how Sakthi reclaims the degraded parai frame drum and dance to re-humanize and empower these young women through the physical embodiment of confidence in performance & reclaimed cultural identity. For our service project, we collected donations to support the Sakthi Folk Cultural Center and support the replacement of Zoe’s equipment, which stolen in Paris while en route to India, to continue her work with the girls of the Sakthi Folk Cultural Centre.